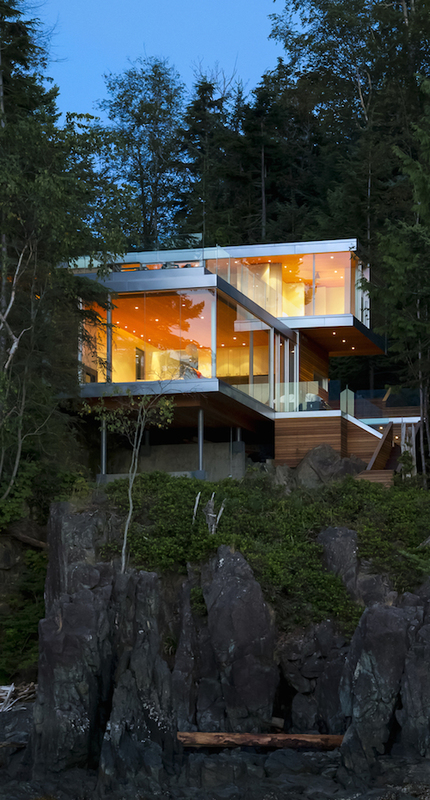 Bold bands of aluminum delineate two glass rectangles stacked to form an isolated cabin by Mcfarlane Green Biggar Architecture + Design. 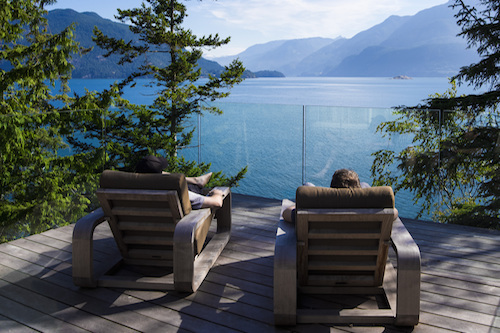 The weekend getaway is perched atop a steep rocky cliff on a rugged and remote island off the northeast coast of British Columbia. 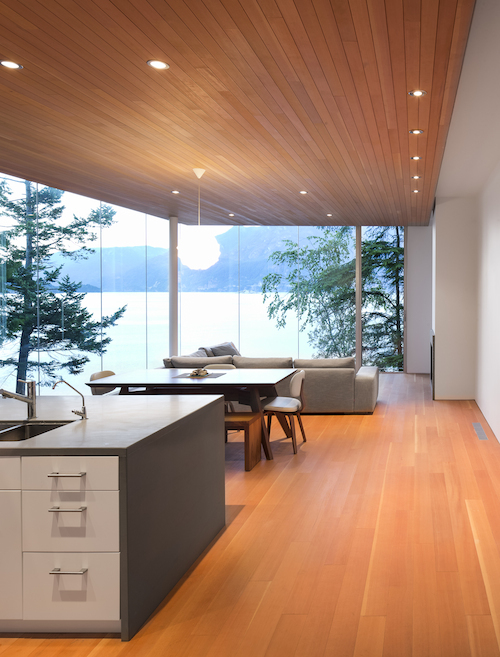 A young Vancouver couple with two children commissioned the isolated cabin on rugged Gambier Island as a contemporary version of a cabin in the woods. 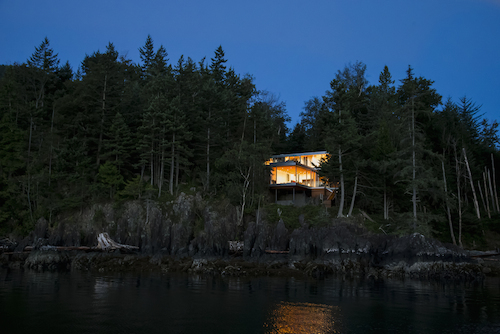 With the remote island’s rugged topography, and difficult boat access, the architects maximized prefabrication offsite. This reduced the number of barge trips needed to deliver materials and remove waste. The remote location of the secluded home meant it is only accessible by boat and the site had strict environmental controls related to the shoreline. So barges brought the two stacked boxes clad in wood, cement board, and insulated glass. One rectangle housed three bedrooms and two bathrooms and the other contained the open plan kitchen, dining and living space. 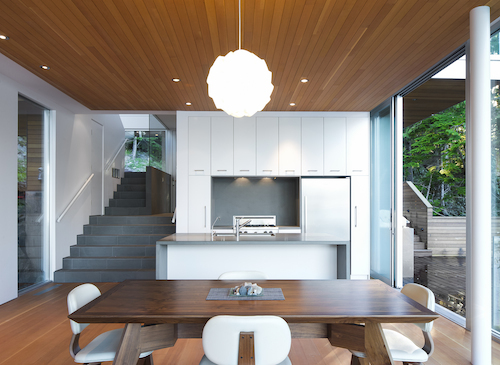 Opening from the middle of the upper rectangle, a rooftop terrace is formed atop the living room rectangle. 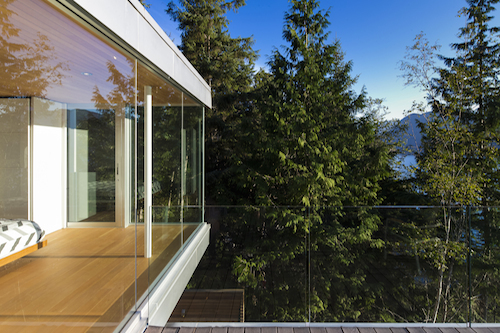 The offset rectangles form a cohesive frame from which to take in the sublime views to the sea and mountains beyond. Despite the huge ceiling to floor glazing on the bedrooms at each end, a sense of privacy is preserved from this upstairs terrace by the short wall concealing the pillow end of the bed. 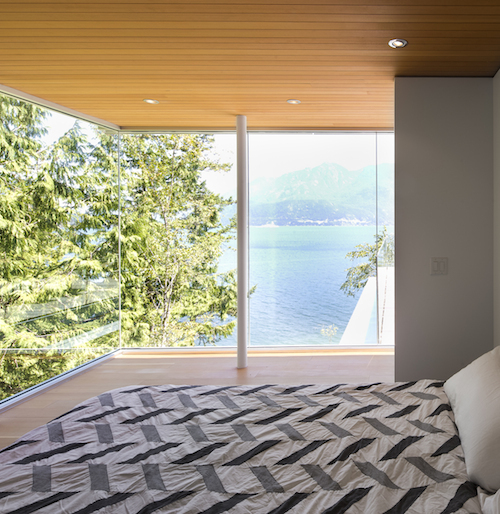 The bedrooms occupy each end of the upper rectangle. 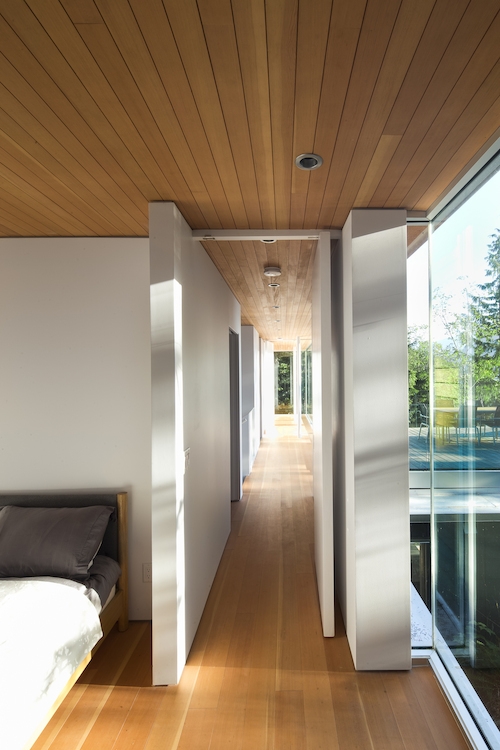 Like the living rectangle downstairs, both floors and ceilings are Douglas fir, creating warm interior spaces. 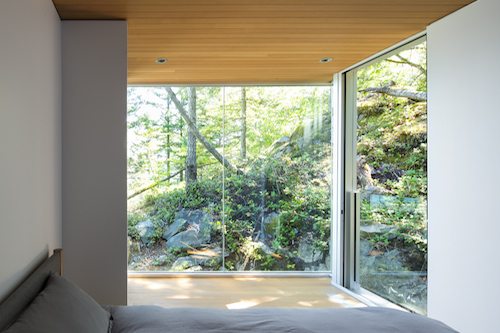 The children’s bedrooms are anchored into the steep forested hillside. 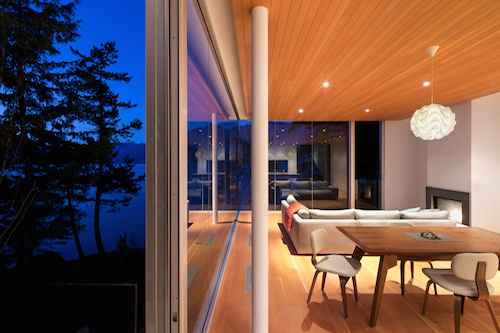 The architects’ successful execution of their prefabrication strategy brought the least possible disruption to the wooded waterfront of unspoilt Howe Sound. This entry was posted on Monday, March 16th, 2015 by Susan Kraemer and is filed under Architecture. You can follow any responses to this entry through the RSS 2.0 feed. You can leave a comment.